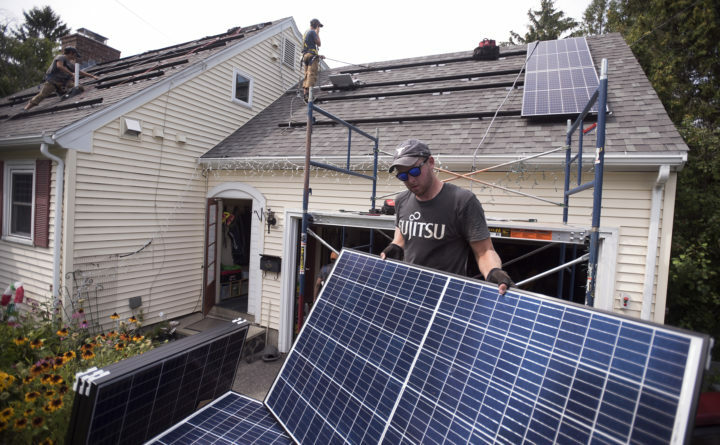 Dillon Fitts of Insource Renewables gets some of the solar panels ready as they were getting installed on Thane Fremouw and Clarissa Henry's home in Orono in this Aug. 22, 2017, file photo. Bangor city councilors have agreed to spend $8,600 to study how much it would cost the city to build and operate solar arrays on municipal properties, as well as what energy savings would come from those investments. At a meeting on Monday night, the council’s finance committee accepted an $8,600 bid from ReVision Energy Inc., a Maine-based company with offices in Portland and Liberty, to evaluate the merits of three different types of solar installation: on rooftops, on carports and on the ground. The city will pay for the 19-day study with funds that it had already budgeted for an audit of its energy supply, said Debbie Cyr, the city’s finance director. For a couple years, local officials have been weighing what investments in renewable energy would reduce the city’s carbon footprint while also making financial sense, Councilor Gibran Graham said ahead of the meeting. The $8,600 bid from ReVision Energy was the lowest the city received and will also pay for 60 days of support as local officials begin to make decisions about potential investments, according to a memo from Tanya Emery, the city’s director of community and economic development, which was circulated at the Monday night meeting. The city received several other bids for the work ranging from $15,950 to $120,000.